HOW YOUNG IS TOO YOUNG TO START A SKINCARE ROUTINE? The issue of when/if/should you introduce a skincare regime to a teen is a tricky one and will ultimately come down to personal preference, but with “bad skin” being the number 1 worry when it comes to confidence in teens, I think it’s a subject worth talking about. I was of the era where Clearasil and Oxy10 graced the shelves of most chemists and we were taught that these would solve all our teen skin problems. Of course, they didn’t and the oil stripping, high alcohol content of many of these types of products only exasperated the problem, but it was simpler times back then and the internet didn’t even exist, let alone social media. Fast forward a few (or more) years and the pressure on teens to want to look good is higher than ever, social anxiety is on the rise and so, sadly is depression among teens. 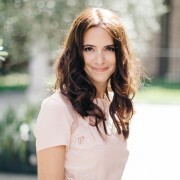 It may seem incredibly trivial to connect depression or anxiety to “bad skin” but to a teen, this is a serious concern, coupled with the fact that every feeling, every worry and every stress is highly amplified in the teen years. It’s not a subject to dismiss on the basis of ‘vanity’ or to ‘let kids be kids’. But where do you start (if at all)? My eldest daughter is nearly 11 and the hormones have already started to kick in, most notably with mood swings, emotional outbursts and moodiness but I have also noticed changes in her skin; the pores are slightly more noticeable on her nose, she gets a little shine on the forehead and around the corners of the nose and she gets the very occasional blemish. Add to this the skin drying effects of her twice weekly swimming sessions and our incredibly polluted walk to school and we’ve got a valid reason to consider skincare. But what do you do? Wait until they are officially ‘teenagers’ to aid the issue, by which time things could be worse and confidence more fragile? The last thing I want is for my daughter to become conscious of her skin (there is nothing to be conscious of, it’s gorgeous) but at the same time, I want to nip anything in the bud before she does consider it a problem. As I said before, this is totally down to personal preference and of course the kid in question should (and absolutely will!) have their say too. My daughter wants to be like her mum (poor girl) she watches me and my skincare routine with absolute fascination, she wants to know every detail of what I do and why, so for her, giving her a couple of products to use alongside me feels like a treat rather than a criticism -which of course it isn’t. The products I chose for her are called OY! (Organic Young) developed by a mum for her daughter, the all natural range is based on plant actives and excludes irritating SLS, parabens, lanolin, alcohol, colourants, silicones and petrochemicals to name a few. The range is also 88-93% certified organic. One of the key actives in the products (and what sold the range to me) are prebiotics. Prebiotics are incredibly helpful in skincare for helping to balance and support good bacteria that live on the skin, and they serve hormonal teen skin even better by fighting all the excess bad bacteria. Every product is incredibly gentle and skin-friendly but the carefully chosen actives are targeted and effective. The range includes a foaming face wash, moisturiser, serum, blemish concealer and roll on deodorant. For my daughter, I feel the face wash and moisturiser will suffice. The pH-balanced cleanser efficiently cleanses deep within the pores, with Willow Bark reducing inflammation and killing off bacteria, and Tea-Tree gently absorbing excess oil. My daughter rubbed it all over her face and accidently got some in her eyes, yet it didn’t sting at all, she enjoyed using it and said her skin felt “fresh” after. I asked if it felt dry or tight and she said not at all. Then for the Clear Skin Cleansing Moisturiser; she loved this! She really enjoyed massaging it into her skin (I demonstrated for her first- just a pea-sized amount on the fingertips). Again, the moisturiser is PH-balanced, which is so important- if the protective acid layer we have over our face is neutralised with alkaline soaps, it allows spot-causing bacteria to get in. It is 89% organic, which can be an important factor to consider for your children, as unlike cleansers, this is not only left on the skin but absorbs into it too. For me and my daughter, this is right for us- I’m happy with the ingredients, and she is happy to use them. She uses both products on average 3-4 times per week as and when she remembers, and again, for us this works. 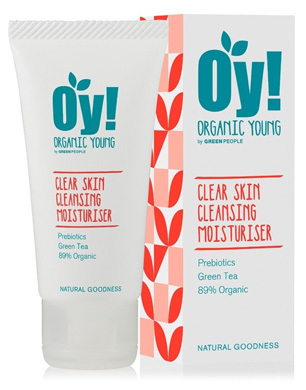 I can vouch for how gentle and effective the products are and if I was asked to recommend products for a teen, I would happily endorse the Oy! range, the rest is up to you and your teen!